IT'S ALL ABOUT THE LOVE . . . This is a true story of two 50-something die-hard romantics who were searching for their soul-mates and found each other the new old-fashioned way: via an internet dating site. This saga is told in a style of: "Let's crack open a bottle of wine and sink into the sofa while I tell you about this incredible journey I shared with this guy who changed my whole perspective on life and love." The story takes place in the Northeast, where Ms. Koelbransen grew up and feels most at home. The majority of the setting vacillates between Central Jersey/Princeton area and Staten Island, New York/lower Manhattan. Ms. Koelbransen takes great care in the lovingly manner in which she verbally sketches a portrait of her living environment and with each successive scene, as it supports the romance that develops between her and her soul-mate, Kevin. Of course, as in any love story, there are two protagonists; Debbi Letizia, the narrator and Kevin Gofraidah, the man she meets and with whom she eventually falls deeply in love. Debbi takes her readers on this journey starting at the end: the funeral of her beloved and then backtracks to the beginning of why and how she meets Kevin. The readers soon learn that Debbi and Kevin have been bestowed a gift of only seven short weeks together. However, as the story unfolds, it becomes evident that their common interests, their passions for life and each other, and the secrets they share and the love that develops from their undeniable bond supersedes any obstacles life has doled out to them — from their past, their present and their future. Theirs is a love that lived a lifetime in those seven weeks together. A triumphantly, cutting-edge, modern-day love story especially focused on the intrinsic challenges the baby-boomer generation can no longer close their eyes to as they have reached the prime of middle-age and have been catapulted into the electronic age of dating and relationships. Despite the challenges Debbi and Kevin face and work to overcome, the author's message is loud and clear: "It's all about the love." Ms. Koelbransen pours out her heart and soul to her readers as if each and every reader were her close and personal friend. This is an intimate peek into the author's personal journal and the emotional rollercoaster ride Debbi and Kevin embrace together throughout this chapter in their lives. Ms. Koelbransen challenges, not only her sorority of 40 year old plus women out there, but the barrage of romantic men who still believe in love at first sight and are still searching for their true love; could you or would you honor a kind of love that would offer you an epiphany, shake up your whole life and make you look at life and love in a whole different way? Would you know it if it tripped along your path? Or would you pass it up for the safe and benign life style to which you have grown so accustomed? Open your heart and to page one and start your journey with Debbi and Kevin. It is all about the love. Online Dating Brings Baby Boomers Together in New Novel Classic love story gets a contemporary, well-timed update in book based on true events BRIDGEWATER, N.J — There's no denying it: Baby Boomers are turning to technology more and more as they advance into middle age, and the popularity of online dating sites has revolutionized their options for dating and relationships. Making up nearly 28 percent of the population, approximately four million Baby Boomers will turn 50 in 2010. With recent statistics showing that one in five relationships now begin online, internet dating is an increasingly viable option for people of all ages. 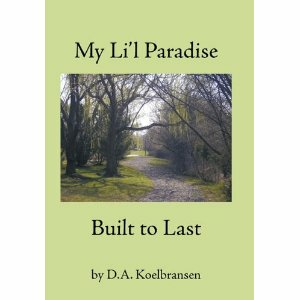 In her modern, fresh new book based on a true story, My Li'l Paradise: Built to Last (published by AuthorHouse), D.A. Koelbransen examines the timelessness of love through the contemporary lens of online dating as experienced by two 50-somethings destined to cross paths. Written in the warm, conversational style of a woman fondly recalling to a friend the "how we met" story about the love of her life, My Li'l Paradise is told in reverse by Debbi Letizia, who backtracks to the beginning of how she came to meet Kevin Gofraidah on an internet dating site. When Debbi and Kevin first met, neither could deny the instant chemistry between them. What followed — and what Debbi shares throughout the pages of My Li'L Paradise — was a whirlwind romance that would last only seven short weeks before Kevin passed away. With a resounding message from the author ("It's all about love," she asserts), My Li'l Paradise emerges as a triumphant, cutting-edge love story as Debbi and Kevin change each other's lives immeasurably in less than two months. Koelbransen uses her expansive emotional palette to paint a vivid portrait of the emotional rollercoaster ride Debbi and Kevin embraced together throughout this chapter in their lives. "Theirs is a love that lived a lifetime in those seven weeks together," she writes. Ideal for romantics who still believe in love at first sight and are still searching for their true love, My Li'l Paradise begs for a film adaptation with its unique style that is part "Titanic" and part "You've Got Mail." Would you take the chance to fulfill your own destiny? Or would you pass it up for the safe and benign life style to which you have grown so accustomed? Open your heart and start your journey with Debbi and Kevin in D.A. Koelbransen's My Li'l Paradise. About the Author D.A. Koelbransen has lived in the New York/New Jersey area all her life and credits much of her inspiration to the diversity of her surroundings. She has had short stories and poems published in both college newspapers and national publications, but My Li'l Paradise is her first published book. In addition to writing, Koelbransen enjoys astrology, designing jewelry and yoga. She has two sons.